Despite all the hoopla about the revolutionary potential for Ecosystem Services to “make conservation profitable” and “align economic forces with conservation”, the reality is that the concept of paying landowners to maintain the environmental services provided by their property is still new and still under development. This isn't to say we shouldn't be excited about the conservation potential here - I certainly am! It's just that we need to keep our near-term expectations realistic and recognize that in most cases, we have a lot to learn about (1) how different land management regimes affect the economic value of specific ecosystem services, and (2) how landowners can best be compensated for maintaining (and restoring) these services. Supporting services - services that are necessary for the production of all other ecosystem services. Some examples include production of atmospheric oxygen by plants, soil formation and retention by plants, insects and microbes, nutrient cycling, water cycling, and provisioning of habitat. Provisioning services - The products obtained from ecosystems, including, for example, agricultural/food and fiber (e.g., crops and trees), fresh water, and genetic resources. Regulating services - The benefits obtained from the regulation of ecosystem processes, including, for example, the regulation of climate, water, and some human diseases. Ecosystem services such as mitigation of floods by forests and buffering against storm surges by wetlands fall under this category. Cultural services - The non-material benefits people obtain from ecosystems through spiritual enrichment, cognitive development, reflection, recreation, and aesthetic experience. At the recent annual meeting of the Ecological Society of America (ESA), I attended a symposium titled “Ecosystem Services in Decision-Making: Stepping Into Reality”. Pioneering ecosystem services experts such as Gretchen Daily of Stanford University, Taylor Ricketts of World Wildlife Fund (WWF), and The Nature Conservancy's Peter Kareiva pointed out that a lot of work remains to be done to turn what are termed "Payments for Ecosystem Services" (PES) programs into viable options for protecting and restoring ecosystems, their resilience to climate change, and the valuable services they provide to society. Just how good are the prospects for successful PES programs to benefit ecosystems and people alike? Already, we have seen some celebrated uses of PES schemes (see page 10 of this link) to protect ecosystems and human welfare. One example is New York City’s use of Catskill Mountain forests to filter its drinking water for a fraction of the price it would have cost them to build a water filtration plant. 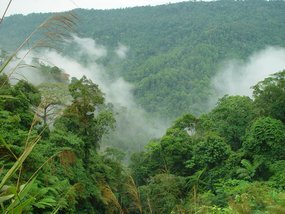 In spite of these early successes, however, as well as the rapidly rising number of studies examining ecosystem services, WWF's Ricketts cautioned that there is still a huge mismatch between the data currently available, and the data that is needed to inform widespread implementation of PES programs. First and foremost, scientists need to understand exactly what PES programs are paying people for. For example, how do we concretely measure and verify the water filtration or flood mitigation services of a forest? How do we quantify the storm protection value of barrier wetlands, such as those that once provided much more effective protection against storm surges for cities such as New Orleans? Need 1: basic academic studies on how different land use treatments affect ecosystem services, from tropical to temperate forests, from grasslands to deserts, and from wetlands to alpine tundra. This includes series of replicated experiments that are regional to landscape in scale, are spatially explicit (in other words, help identify where on maps ecosystem services are provided), and explore how multiple services are affected by multiple management regimes (for example, how a forest's ability to maintain a snowpack and store water might be affected by leaving it intact, vs. selective logging, vs. clear-cut logging). Need 2: figure out how to actually get people paid for ecosystem services – to determine how to turn these services into economically and politically viable conservation solutions. As Gretchen Daily pointed, out, development of any PES plan will require that a multidisciplinary team of ecologists, economists, policy experts, and lawyers (and probably marketing and communication experts) partners to answer the following questions: Who pays? How much? To Whom? For what? For how long? Need 3: Develop and explore new management and policy tools and approaches for implementing PES programs. Realistically, approaches that work in developing countries, such as Costa Rica’s fuel tax that funds rainforest conservation, won’t necessarily work in a country like the United States, where proposing a new tax is politically risky. What works to make a PES plan a success may vary from country to country, and even from culture to culture. Just how monumental is the challenge of converting emerging scientific understanding of ecosystem services into new PES programs? As Steve Polasky of the University of Minnesota pointed out, we are having enough difficulty applying what we already know about how to improve human welfare by protecting ecosystem services. The failure to convert scientific understanding of ecosystem services into benefits to human communities was clear with the flooding in New Orleans, for example, where a pathway dredged through barrier wetlands (the "Mississippi River Gulf Outlet") acted as a funnel that directed Hurricane Katrina's storm surge into the city. Fortunately, the devastation suffered by New Orleans appears to be helping spur awareness of the economic importance of protecting the ecosystem services that wetlands provide. Need 4: Choose test sites wisely to maximize impact. Panelists pointed out that we would be smart to prioritize locations for PES schemes based on the value of the ecosystem services provided, how endangered and in need of protection the ecosystem is, and how positive the prospects look for working with and improving the livelihoods of the ecosystem's human communities. By prioritizing and applying PES programs to sites with high ecosystem service value, that are particularly endangered, and where the program can provide jobs and otherwise improve the welfare of the local community, we can magnify the benefits. To be sure, the conservation community is energized about the potential for PES schemes to establish incentives that reward landowners for protecting the environmental services that their lands provide to society, instead of just regulations that punish landowners for failing to do so. As Ricketts noted, the concept’s clear linking of conservation to human welfare is an attractive selling point that is also likely to help the public “get” the importance of a healthy environment. For those of you who want to learn more about ecosystem services, check out the Natural Capital Project. It was recently established to advance the field, and turn its exciting promise into on-the-ground successes in both protecting ecosystems and improving human quality of life. Today, carbon trading...is estimated to be a nearly $790 billion marketplace with individual, corporate and government participants. Now at least one member of the Chicago Climate Exchange sees a similar future in solving a more immediate environmental challenge: water pollution and shortages. “When I got involved in carbon offset development, it became obvious that water was potentially a bigger market than even carbon,” says John Regan. Regan founded the Environmental Credit Corp., a carbon-credit supplier on the Chicago Climate Exchange; he is also the chairman of Biofinancial Corp., a Santa Cruz, Calif.-based family of hedge funds. the shrinking of snowpacks in the Sierra Nevada, Rocky, and Cascade Mountains, which poses a considerable threat to agricultural and drinking water supplies in the Western United States. A major key will be to use proceeds from this type of market to reward landowners for implementing land management strategies that maximize the capacity of ecosystems to generate, store, and filter water. Our friends in the wonderful land Down Under - a country that I visited while studying abroad, and that I can't wait to get back to - have published an outstanding article by eminent ecologist, Tom Lovejoy on the importance of forests to the battle to combat climate change. As Lovejoy notes, "approximately 23 per cent of greenhouse gases accumulating in the last analysed year came from deforestation and biomass burning. When those gases are counted in, Indonesia is the world's third largest emitter and Brazil the fourth." The details of course will be important, such as mechanisms to actually get the financial incentives to the right places, especially the communities in the forested regions that deserve reward for forest protection. A careful balance between being careful and thoughtful about details and implementation, vs losing precious time through ponderous bureaucratic procedure, will also be key. Also crucial to dealing with climate change, he adds, is "the management of nature to ease the adaptation to the climate change already taking place." Ripples of change are being detected in nature worldwide in response to the 0.7 degrees C warming that has already occurred. Plants and animals are on the move, threshold changes are occurring in some ecosystems, and the seas are already 30 per cent more acidic (affecting organisms with calcium carbonate shells). We know an equal amount of climate change will occur just from existing greenhouse gas concentrations and the lag in climate response. The ripples of change in nature will be succeeded by the shaking of the very biological underpinnings of human civilisation. There are two ways to minimise impact: one is to reduce other stresses on natural ecosystems such as pollution and invasive species, and the second is to assure natural connections in the landscape so organisms can move freely in seeking required conditions in a changing world. Without the latter the landscape represents an obstacle course to such movement. With climate change's impacts increasingly rippling from environment to economy to health and security, we have little time to spare. The topic of ecosystem services has hit the mainstream - Wired magazine with a new article titled, "Eco-Capitalists Save Mother Nature By Charging For Her Services". Thanks to Adam Davis for the headsup! Can extinct salmon runs be restored? Stories like this bring an inspired smile to my face! This influx of energy from the ocean can have an extraordinary effect on freshwater systems because the nutrient composition of the fish and their densities are so great. For example, an adult male chum salmon on the spawning grounds contains an average of 130 grams of nitrogen, 20 grams of phosphorus and more than 20,000 kilojoules of energy in the form of protein and fat. Multiplying the average nutrient composition of salmon by the total number of returning fish, we found that a 250-meter reach of stream in southeastern Alaska received more than 80 kilograms of nitrogen and 11 kilograms of phosphorus in the form of chum salmon tissue in just over a month. The articles we choose reflect a key component of the mission of Conservation Value Institute: Educating the public in connections between a healthier environment and a healthier economy, healthier people, and a better quality of life. 2. Benefit both people and planet indirectly -- for example, an article about a green product or practice, such as a new advance in solar technology, people eating organic and local, a new type of clean vehicle being released or used. The story doesn't directly mention that the product or practice saves money, protects our health and safety, or improves our quality of life. But that value is there. For example, a company converting its fleet of cars to plug in hybrids is going to save it lots of money on gas costs, even if the story doesn't mention it. Also, the bottom story is always an "Impacts of Unsustainability" story -- a story about how some type of pollution, habitat destruction, or unsustainable waste management practice, for example, is having a negative impact on people and planet alike. The point of these stories is to demonstrate another wonderful benefit of sustainability: all the horrible things that making greener choices helps us to avoid! When we complete our web site revision (please contact us if you are are a graphic designer and/or programmer interested in helping), we'll add a category for Global Warming, and will probably add one for motivating change - communication and education. Anything else you'd like to see? Enjoy, and please do drop us a line if you have found any good stories that we should check out. We love suggestions from our readers! Climate Change - If Al Qaida Was Threatening To Cause It, We'd Be Going Nuts to Stop Them! Yet that is precisely the threat that we’re creating ourselves, with our greenhouse gases. While there is still much uncertainty about the severity of the consequences, a series of new studies indicate that we’re cooking our favorite planet more quickly than experts had expected. Kristof was reacting to a series of new studies that should be getting much more attention in the traditional mass media than a few miners tragically trapped in a Utah coal mine. The newly published studies haven’t received much attention, because they’re not in English but in Scientese and hence drier than the Sahara Desert. But they suggest that ice is melting and our seas are rising more quickly than most experts had anticipated. 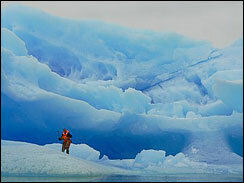 In case you missed the May edition of “Geophysical Research Letters,” an article by five scientists has the backdrop. They analyze the extent of Arctic sea ice each summer since 1953. The computer models anticipated a loss of ice of 2.5 percent per decade, but the actual loss was 7.8 percent per decade — three times greater. The article notes that the extent of summer ice melting is 30 years ahead of where the models predict. These findings provide further evidence for the fact that climate change is happening faster than anybody in the scientific community expected, and appears to be accelerating -- a trend that I've reported on several times here and will continue to keep you up to date on. • Science magazine reported in March that Antarctica and Greenland are both losing ice overall, about 125 billion metric tons a year between the two of them — and the amount has accelerated over the last decade. To put that in context, the West Antarctic Ice Sheet (the most unstable part of the frosty cloak over the southernmost continent) and Greenland together hold enough ice to raise global sea levels by 40 feet or so, although they would take hundreds of years to melt. We hope. • In January, Science reported that actual rises in sea level in recent years followed the uppermost limit of the range predicted by computer models of climate change — meaning that past studies had understated the rise. As a result, the study found that the sea is likely to rise higher than most previous forecasts — to between 50 centimeters and 1.4 meters by the year 2100 (and then continuing from there). • Science Express, the online edition of Science, reported last month that the world’s several hundred thousand glaciers and small ice caps are thinning more quickly than people realized. “At the very least, our projections indicate that future sea-level rise maybe larger than anticipated,” the article declared. “Over and over again, we’re finding that models correctly predict the patterns of change but understate their magnitude,” notes Jay Gulledge, a senior scientist at the Pew Center on Global Climate Change. As I've advised time and again in this blog, rather than focus on the gloom and doom, let's focus on turning to the potential good news here into reality: that the solutions -- in the form of cleaner, more efficient, and more sustainable technologies and practices -- will benefit our economy (e.g., by lowering energy costs, creating jobs, creating whole new industries), security (e.g., by freeing us from dependence on foreign oil), public health (e.g., by reducing the deadly impacts of air pollution on human health), and overall quality of life. 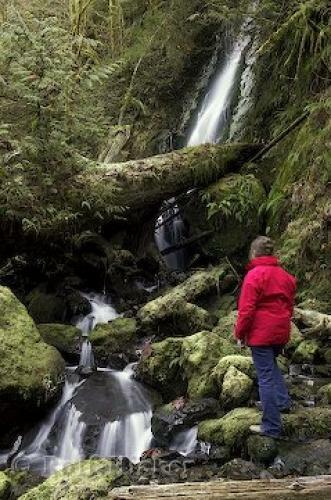 Here's a neat story about human health concerns -- about drinking water quality -- stopping a logging project in British Columbia. It's a nice illustration of how the benefits people reap from sustainably managing forests can be made clear by the threats posed by unsustainable management practices. Barry Janyk, who is both the mayor of the town of Gibsons and a member of the regional district board that approved the order in a vote Saturday, said the public response to the decision has been overwhelmingly positive. “We've heard nothing but praise, without exception. … There's a sense justice has been upheld,” Mr. Janyk said from Gibsons. Mr. Janyk said that during five days of hearings, the regional district heard conflicting statements on the impact of logging on drinking water. In the end the directors decided to opt on the side of caution. “This really goes to the whole principle of is it worth the risk?” he said of weighing the economic worth of logging against the value of clean drinking water. Right now, even though both logging and clean drinking water have lots of value to human communities, forest owners can make money by logging their land, but not so easily by maintaining its "ecosystem service" of providing clean drinking water. Groups like the Natural Capital Project are working to change this. I look forward to following their progress! Forest fires in the Sierra Nevada are bigger, hotter, more numerous and they are killing more trees than ever as a result of human fire suppression and climate change, according to data from a fire severity monitoring study released Wednesday. The information, culled from 21 years of monitoring in the Sierra by U.S. Forest Service personnel, shows that recent fires have left gaping scars in the forest. Interestingly, as fires burn through more acres of forest, the result is to reduce shading of the forest floor -- and as a result, to reduce the depth and longevity of the snowpack. The logical feedback would then be that as fire frequency and severity increase, tree cover and shade at ground level will decrease, slowing the growth of the snowpack throughout the winter, and accelerating its melt in the spring. The same impact can be applied to the shade-reducing impacts of clear-cut logging on the snow pack, points out my friend and colleague, UC Davis conservation biologist, Jim Thorne. 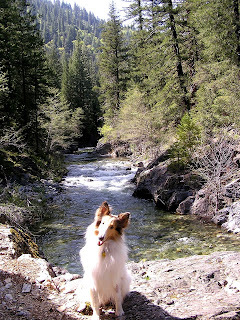 Perhaps this type of land management is not such a good idea in a warming world if we are to protect the snowpack and the precious water that it provides. Does that mean that management of forests to protect their environmental service of providing water will result in the phasing out of clear-cut logging? If there is any political force in the American West that can stand tall against that of boardfeet of timber, it is acrefeet of water. If not now, when? If not us, who? It is time for our community - ecologists - to advance a vision for ecological literacy that will inspire and guide the urgent work ahead of us in fostering environmental citizenship among all Americans. The Summit's organizers, including Alan Berkowitz of the Institute for Ecosystem Studies and Carol Brewer of the University of Montana, broke participants up into groups, who each had brainstorming sessions to identify 5 basic elements that the public should know about ecology. A key goal was to come up with ways to get the public to engage in becoming good environmental citizens. 1. People need better knowledge of where scientific information comes from. It's not just an article of faith. The fact that many people still don't believe in global warming and even trust the bible over science as a source of environmental information suggests that people need better understanding of how science is produced. This being via the elegant scientific method -- the use of carefully designed experiments to test a hypothesis (address a question), and then either accept or reject the hypothesis and formulate a conclusion based upon results. The link between human activities and climate change, for example, has been determined not by a bunch of wacky wookies, but via decades of brilliant research that has gradually addressed remaining areas of uncertainty and ultimately achieved scientific consensus on the matter. Under this element of where scientific information comes from, the public also needs better understanding of scientific uncertainty. Uncertainty is a crucial element of discussions between scientists because it helps us identify and fill key information gaps. However, when scientists talk about uncertainty in our findings to the public, it tends to cause a lot of confusion. The result is often to hinder very appropriate conversions of the best available science into on-the-ground management and policy solutions. We need to foster greater public awareness of the difference between uncertainty about finite details of scientific understanding, versus uncertainty about whether scientific understanding is sufficient to justify management and policy changes. 2. The Environment and You: We need to improve public awareness and understanding of the value of the services that nature provides to everyday people and to society. This includes understanding of how we are a part of nature -- how our everyday choices either improve or degrade our environment, economy, health, security and quality of life. Today, too many people seem to have forgotten that we are a part of nature. We need to make it clear how keeping nature healthy is good for people, and to establish incentives that reward those who make environmentally friendly choices. Children should be taught, from an early age, about the many ways that nature is important to human well being. 3. Appreciation for Life: We need to foster greater public appreciation of the different types of life on earth. These include the letters of diversity - some basic awareness of the birds, mammals, trees and other plants in one's area. As people become more aware of their surrounding environment, they tend to become less likely to harm it. Field trips and creating school gardens were cited as ways to foster appreciation for life. 4. Nature and its ecosystems are dynamic, not static - they change over time (and humans can be and are often agents of causing and accelerating this change). Even if damaged, restoration is still possible. Local Examples Are Most Powerful: The group agreed that using local examples will be most effective for making these lessons stick. People tend to be most interested in learning about the plants, animals, and other natural elements in their area. What other elements of ecological literacy can you think of that are important for fostering environmental citizenship in America and beyond? Note: this discussion is being continued over the course of the next year, leading up to the theme of the 2008 Annual Meeting of the Ecological Society of America, which is...Ecologial Literacy! Apparent climatically induced increase of tree mortality rates in a temperate forest: After tracking the fates of more than 20,000 trees in a network of old—growth forest plots in the Sierra Nevada of California for over two decades (1983 — 2004), USGS scientists found that tree death rates have increased significantly over the past 20 years. Death rates increased not only for all trees combined, but also across most elevational zones and for the two dominant groups of conifers, firs and pines. The rising death rate for trees was paralleled by increasing summer drought due to warming temperatures. These findings suggest that Sierran forests, and potentially other forests of dry climates, may be sensitive to temperature—driven increases in drought, making them vulnerable to extensive die—back during otherwise normal periods of reduced precipitation. With more dead trees equaling more fuel for fires, local officials will need to carefully consider how to tweek zoning laws to keep new homes out of vulnerable areas, as well as ensure that building codes and property maintenance requirements are adequate (and adequately enforced) to minimize risk to homes and businesses. Possible building code solutions include mandating fireproof roofs, a layer of fireproofing around homes at ground level, and keeping piles of fireplace logs in a fire-proof location, rather than right on the side of the house. Brush and pine needles should also be cleared from the area immediately around homes. What about forest thinning treatments to reduce fuels in the forests surrounding Tahoe homes and businesses, you may ask? These kinds of treatments are generally intended to slow the spread of crown fires by increasing the distance between trees. Interestingly, however, I've heard reports from Tahoe locals that it was actually both ground fires and, especially, airborne embers from burning trees and houses, not crown fires, that resulted in the destruction of many homes. 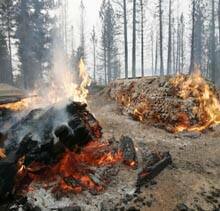 Ground fires would not be significantly slowed by forest thinning. In fact, the fire spread right through areas that were thinned only months ago, jettisoning burning embers high into the air, many apparently landing on and igniting inadequately fireproofed homes. Some think that thinning may have even made the area more vulnerable the type of fire that occurred by increasing exposure to the drying influences of sunlight and wind. For the many homes that were not only located in highly fireprone habitats, but also inadequately fireproofed, the result proved disastrous. Whatever the solutions -- better zoning, much better fireproofing of structures, or adjustments to forestry practices -- this new finding that warming temperatures are increasing tree death and wildfire danger provides yet another illustration of how climate change is very much a people issue. It seems that every day, we hear of new people and companies going "carbon neutral". However, the carbon offsets market is still kind of a wild west: it's not clear how much of our offset funds are really being invested in the development and implementation of carbon reducing projects, and how much are just going into slick marketing aimed at selling more offsets. So what will it take for the carbon offsets market to live up to its promising potential for reducing carbon emissions -- by funding projects in such areas as tropical forest conservation, renewable energy development, energy conservation, and methane sequestration? This was the question I posed to Don Kennedy, editor of the prestigious journal, Science, yesterday, at the conclusion of his lecture overviewing basic strategies for combating climate change. The carbon offsets market needs regulation, Kennedy quickly responded at last evening's opening plenary of the annual meeting of the Ecological Society of America. "There's a lot of fraud out there," and the market needs Consumer Reports type oversight with regulatory clout. At a time that the consequences of not taking action to solve climate change are becoming clearer and clearer (as are the benefits of taking action, as demonstrated by this story, for example), we just can't afford for these solution-seeking dollars go to waste. We absolutely need standards and guidelines that provide buyers with rock-solid assurances that moneys from their purchases of carbon offsets are being used to reduce the amount of carbon emissions they are paying to offset. As far as certifications or standards, there is Green-e and the WWF-supported (and more stringent) Gold Standard, though both are voluntary. While we're bound to continue to see articles like this until the problems are fixed, the good news for both offset buyers and the planet is that it finally seems that standards with regulatory clout are on the way. I can't wait to see what they entail, and to buy my offsets from providers who meet the best of these standards! I'm headed down to San Jose this evening for the start of the annual meeting of the Ecological Society of America (ESA). Now that the reality of climate change has achieved full-bore political momentum, it is driving a whole portfolio of proposed responses -- mitigation strategies, alternative energy sources, and geoengineering solutions. If we're too eager for a solution, we may not give careful examination to the externalities of each proposal. Don Kennedy will run through a few examples. I'll share my thoughts on this lecture later or tomorrow. Stay tuned this week as I provide daily updates on fascinating emerging findings and solutions as they relate to the focus of this blog. I love some of the new web sites and tools that are being devised to improve communication of environmental issues to the masses. Here's a new sustainability tool kit for marketing and advertising courses that "offers all kinds of pedagogic resources - short presentations, campaign analyses, exercises, web links, bibliographies and more than 300 downloadable documents - to encourage students and communication experts to think about and involve themselves in" sustainability. Even whole countries are working to improve communication of the science of sustainability to everyday folk. Here is an article about Zimbabwe urging its researchers to simplify scientific terms so they can be understood by ordinary people. "We need simplified language so that everyone benefits from the knowledge," the country's environment and tourism minister said. The issue is urgent. For if scientists cannot relate the importance of our findings to the (voting) public and decisionmakers, then the science won't be properly used to make our world better. Imagine this was happening with medical science to the same degree it's happening with environmental science! Speaking at the same event in Zimbabwe, the country's Science and Technology Development Minister, Cde Olivia Muchena, called on stakeholders to increase dissemination of information to raise people's awareness about environmental issues. "Let us raise levels of awareness until there is a flood," she said. 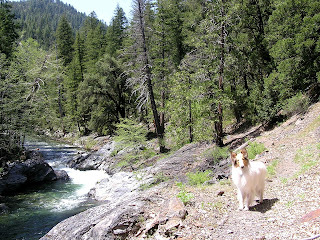 Some friends have suggested that I post a few pics of our rare white collie, Qanuk, from recent camping trips. 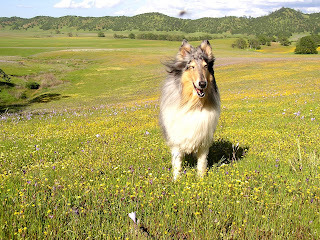 We're not sure how old Qanuk is, as we got him from NorCal Collie Rescue after he'd been picked up off the street and brought to an animal shelter covered in burrs and very underweight. Maybe 1.5 to 2.5 years old, but based on his puppyish behavior, definitely not over 3 yet. Since we picked him up in mid-March, we have been feeding him great food (Solid Gold), vitamins and more to boost his immune system. His recovery from mistreatment has been phenomenal -- he's gone from 49 lbs to over 63 lbs, really filling out his muscular frame! Luckily, Qanuk's got very little baggage, and his personality is really beginning to blossom as he gains confidence. He's got a great sense of humor - very silly boy. One morning I woke up and he was lying on my bed with his back next to mine, and his head on the same pillow as mine! Enjoy the pics, and have wonderful weekends! 4. 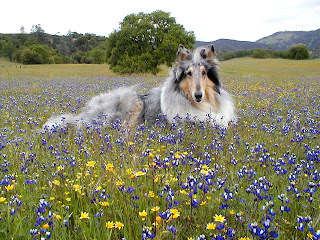 Cody, Spring 2005, Bear Valley, Colusa County, CA.